In this article, we’ll tell you which drone laws apply in Namibia and what hurdles you have to take to fly a multicopter in the country legally. In Namibia, all drones must now be registered. Different requirements are depending on the purpose of your flights. A formal letter of application to the Executive Director of the Namibia Civil Aviation Authority (NCAA) detailing the purpose of the drone flights and their intended duration. A map with the intended flight areas and the coordinates of the ascent location. Documentation of the aircraft, which shows the technical standards of the drone. Proof of payment for the transfer of the processing fee of currently 1,200 NAD (about 80 Euro). You see, getting official approval from the NCAA is extremely time-consuming. I doubt that the cost of a private vacation is worthwhile. Proof of registration of all drones. RLA for every single drone. Operations Manual according to the specifications of the NCAA. Proof of payment for the transfer of the processing fee of currently 4,500 NAD (about 308 Euro). Regardless of NCAA approval, you must obtain written permission from the property owners (individuals, authorities, organizations) before each flight. This obligation applies to both private and commercial drone aviators. All granted permits must be carried when copters are used. For many tourists, the use of a drone in the national parks is indeed a tempting idea. Poachers also use drones. It is a fact that drones can disturb the wild animals. The legislators had good reasons to ban the use of drones in national parks. This prohibition applies at a distance of 9.3 kilometers (5 nautical miles) around the protected areas. If you still want to fly in a national park or a reserve, you need the approval of the NCAA and the permission of the responsible nature conservation authority. If you can not show them and get caught by a ranger, you have to expect fines. Once you have obtained your permits, you must abide by the following rules. Maximum Altitude: In Namibia, the maximum altitude allowed for drones is limited to 45 meters (150 feet). Maximum horizontal distance and FPV: Drones are allowed to operate in Namibia only within the direct range of sight. Compulsory insurance: In Namibia the conclusion of an aviation liability insurance is mandatory. Maximum take-off weight (MTOW): Currently I have no information on weight limits. Distance to airports: For the outer boundary of airfields in Namibia a distance of 9.3 kilometers (five nautical miles) must be observed. Other safety distances: For uninvolved persons, other objects (such as vehicles, buildings, etc.) and roads, a distance of 50 meters must always be maintained. Flight Bans: Multicopters are not allowed to fly over crowds. Public roads may not be used as a take-off and landing site. Operating Hours: Drone flights are only permitted in daylight in Namibia. Special legislation: Each drone may only be registered under one ROC. This means that every commercial drone can be assigned to precisely one pilot. Rules for Commercial Pilots: Commercial pilots must apply for a ROC (see above). 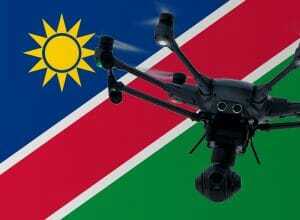 We have researched the listed drone regulations for Namibia to the best of our knowledge. We cannot guarantee the correctness of the information. If you want to be on the safe side, contact the competent aviation authority. Alternatively, you can also ask the embassy in your country for further information about the regulations. Please leave us a comment when you receive news and/or gain experience with your copter in Namibia! My wife and I will be travelling through Namibia, Botswana, Zimbabwe, Malawi, Mozambique, Tanzania, Kenya, Uganda, Ethiopia, Sudan and Egypt on an overland trip. I have travelled through South America so far with no problems. Is it ok and safe for me to bring my drone (DJI Mavic). I just need to know whether I can safely bring it over each border without it being confiscated. From what I can see drones are legal in these countries now, just some countries are more strict in allowing you to fly it. Any country where we may need a permit we obviously won’t fly. Do you know if all of this is true? I recommend you to check the laws of every country. You named a few nations where it is difficult to carry a drone. Did you travel with your drone through Namibia? Was there any issue? I have a small DJI Spark that I want to take with me on holiday next month. Can you explain what I need to do here “Risk analysis and a “Safety Management Plan.””? Shall I just write a document based on what is online to this topic? or do I need to make some kind of assessment?